Filter/Cafetiere: Green Apple initially with Cocoa notes through the body with a lovely subtle Creamy Walnut aftertaste. Espresso: Green apples upfront, Cocoa through the body with a Creamy Walnut like finish. Brew ratio: 20 grams of coffee to 300 millilitres of water. Temp of Water 93 degrees. Brew for 3 - 5 minutes. Full Medium Roast colour spectrometer profile 114. Tasting Notes: Green Apple initially with Cocoa notes through the body has a lovely subtle Creamy Walnut aftertaste. Tactile Note: A fantastic decaffeinated coffee very different from what you would expect Smooth, Creamy & Clean. Brew ratio 1:2. 16 grams of coffee to 36 millilitres of water. Temp of Water 93 degrees. Full Medium to Full Medium Roast colour spectrometer profile 104. Aroma Notes: Cocoa & Apples. Tasting Notes: Green apples upfront, Cocoa through the body with a lovely Creamy Walnut like finish. Tactile Notes: Smooth, Creamy & Clean best served as a latte or flat white for early risers or alternatively great as an espresso all day. Chemical free Swiss Water Decaffeination Process, using only water the process is 100% chemical free maintaining the taste complexity of the coffee while removing the caffeine. 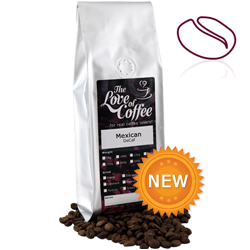 From the Chiapas region in the South Western part of Mexico comes this light bodied coffee. First a diffusion process is used which allows the gentle displacement of caffeine from green coffee. Green beans are soaked in a Green Coffee Extract (GCE), which is pure water saturated with soluble solids from green coffee. With time and temperature, the caffeine migrates out of the green beans into the GCE. This water is filtered, capturing and extracting the caffeine molecules. The flavour and body of the coffee is protected by closely monitoring the solids, caffeine levels, and moisture in the coffee. The process takes approximately 10 hours resulting in green beans that are 99.9% caffeine-free. Once the decaffeinated beans are removed from the GCE, they are then dried, finished, bagged and shipped and then ready to be roasted.